This interview was conducted while Kawasaki Norio Sensei was in Moscow for the KWF Russia training camp on February 18-19, 2006. — What in your opinion is the technical level of participants of this training camp in Moscow? — I see that you’ve made great progress as compared with your results last year. It’s really very good. — Last time you paid special attention to forward and rotatory movements such as “oi zuki”, “mae geri”, “gyaku zuki”. 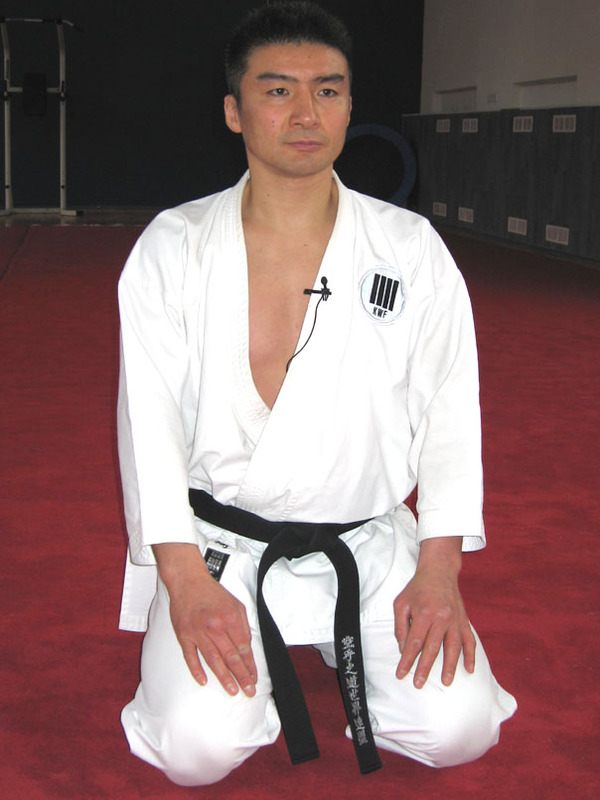 It’s no secret that Yahara Sensei likes reverse rotatory movements in combination with round blows such as “uraken uchi”, “shuto uchi”, “kentsui uchi”. However there’re not such movements in the classical KWF grading syllabus. When are they going to be introduced into the obligatory grading syllabus? — Yes, there’re three types of movements in the karate. They are forward, rotatory and reverse rotatory movements. First of all it’s very important to master such movements as “gyaku zuki” and “oi zuki”. To master a reverse rotatory movement (for example spin of the body followed by “yokomawashi uraken uchi”) it’s necessary to be able to keep a tough axis. I’m going to devote my next seminar in Russia exactly to this topic. — You gave young Russian and Ukrainian karateka a lot of advice and recommendations on how to develop their technique. And what should coaches pay attention to when working with children of 4–6 years old? — First of all they should pay attention to discipline, acquaint the children with the habits and etiquette of karate, and develop accurate movements and Samurai bearing. And then they should bring up the children to have competitive spirit. — In karate we always deal with such techniques as “shuto uke” and “yoko geri keage”. However they’re quite seldom used in kumite. What do you think of it? — I think such exercise as “yoko keage” helps us to strengthen lower extremities and is quite good for our hips. It’s very important for such movement as “mawashi geri”. When training we do a lot of big movements (“age uke”, “soto uke”, “gedan barai”). We train our motor skills. But it doesn’t actually mean that we’ll be using exactly same big movements in kumite. And “shuto uke” is not an exception. — When did you go in for karate? — I was 18 years old. And since then I’ve had only one coach — Yahara Sensei. His technique seemed to be incredible for me. Incredible strength and speed… I was really astonished at him. — What were the kumite like when you were taking a “Kenshusei” course? What sort of contact was it? — Does it mean that what Amos Richard wrote in his article about “Kenshusei” is true? — Yes. Amos was my Sempai and my Sensei Yahara Mikio was at the head of the course. I was taking the course with Yamaguchi Takashi. — What impact has a “phylosophy of one killing blow”, “ippon waza”, “oi zuki” had on your life? — “Kizami zuki”, “gyaku zuki” are more likely to be defensive techniques. In “oi zuki” it’s very important to brace up and deliver a blow. I’m a persistent person and never give up. — Really? I don’t believe you. It is Yahara Sensei who really has got an excellent “mawashi geri”. — By the way, what part of feet, “koshi” or “haisoku”, did you use in competitions? — Both, but I think in competitions (“shiai kumite”) “haisoku mawashi geri” is less harmful for the opponent, especially when speaking about blows on the head. — “Kakato otoshi geri” is very popular in other fighting systems. What do you think of this blow? — It’s a good technique. As for me I’m not very tall and my stretching isn’t good either. That’s why I don’t use this technique. — During the demonstration performance (“enbu”) you were using such a blow which is a cross between “uramawashi geri” and “yoko geri kekomi”. Is it something special? — Yahara Sensei usually uses such a blow. What is important in it is the use of your hips. — Yahara Sensei is the leader of the International Security Service. Does he teach such special techniques as blows to the throat, groin, eyes, joints for the neutralization of the opponent? — We don’t pay much attention to it. — In honbu dojo you’ve got a big boxing bag. Do you use it in training? — Yes, of course. It’s very good for working through various techniques and combinations. I like “oi zuki”, “uraken uchi” and some kicks. — Do you practice “tameshiwari”? — Sometimes. I usually break three standard wood boards 2,5 cm wide. However Yahara Sensei prefers thick and damp wood boards. My own record is two boards of this type. — Have you ever gone in for jogging, swimming or other kinds of sport in order to feel fit? — Have you got enough time for your own training? — Three times a week I attend a group with the coach Yahara Sensei, and once a week I coach myself. The rest of the time I teach karate. — And how do you relax after such continuous and hard training sessions? — Have you got your favorite kata? — Many years ago I practiced “kanku sho”. When I was a trainee in JKA headquarters I liked “nijushiho”, later it was “sochin”. One month before the championship in Nagano (Japan, 2003) Yahara Sensei didn’t approve of my choice and he made me learn “gojushiho dai”. So one month later I took the third place. — How do you prepare for tournaments? — What you should remember is that we haven’t got any competition methods or technique. 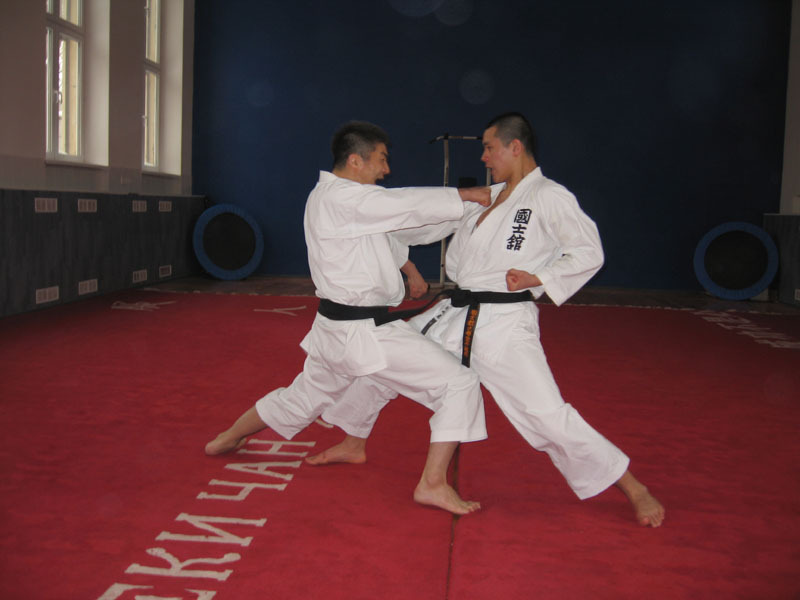 Preparation means continuous training where “kihon”, “kata” and “kumite” are coached as a single whole. Such is indeed the basis of the KWF system. So no secrets and no techniques at all! — Have you ever had a chance to do some blows when jumping? — No. I’m not very good at it. I’m an “earthy” person. (Laughing.) But Yahara Sensei can do them very well, very accurately and efficiently. — Do you think that kata should be beautiful? — Samurai sword is perfect and beautiful since it’s made only for killing. So the same we can say about kata. If the budo athlete using some technique can kill an opponent the kata is really beautiful. — What kata are seniors of honbu dojo practicing now? — One kata the whole year? — Have you ever used karate techniques in your everyday life? — Have you ever gone in for any other kinds of martial arts? — Yes, when I was a child I went in for judo but I didn’t achieve much success in it. — Nowadays the problem of using dope has become very urgent. What do you think of it? — I’ve never taken it. I think using it in martial arts is out of the question. — Do you pay attention to dan ranking? — In Japan in contrast to Russia and the West things are much easier. Nobody pays attention to what “dan” you’ve got. I think your skills are much more important than having this or that “dan”. For example, when I took up JKA trainee course “Kenshusei” I had the third dan. During the next decade I didn’t take any exams until Yahara Sensei made me do it. Now I’ve got the sixth dan and I’m not planning to raise the level of my dan qualification. — Well, we had plans about it long ago when finally Yahara Sensei took a decision to make a film. I think we’ll begin making the film this year. Its video version will be available on the web site of KWF. By the way, an issue of a popular Japanese magazine “Karatedo” about Yahara Sensei is coming out soon. — On the website there’s some information about the deceased Tange Sensei. Could you tell us something about him? — His death was really profound grief for us. His strength of mind and devotion to karate were fabulous. He suffered from cancer. However he went on training. One day after the training he did the “rei” and … died right in dojo, in karategi. He will always be a supreme karateka. We’ve got his portrait in the headquarters. — Probably one of the most spectacular and unforgettable demonstration performances (enbu) of Yahara Sensei when he’s using chairs. How old is this enbu and has it changed after a number of years? — What do you think of meditation? — We usually meditate after training. It helps us to relax. — Do you believe in “ki” energy, in something supernatural? — Yes, I do. My wife is from Kamakura, an ancient Samurai city. Some people in Kamakura have got exceptional ability to see people’s souls. And my wife is one of them. However I don’t believe in “energetic blows”. — How do you spend your free time? In Russia for example people tend to go to the country at the weekend. — I work as a karate instructor 7 days a week. I prefer to spend my free time with my family. I would very much like to find some time to travel around Japan since I haven’t seen much of my country. I hope I’ll have a chance in the future. — Have you been to New Caledonia? — Yes, I was there with Yahara Sensei. We had some demonstration performances for the inhabitants and tourists. Having broken some wood boards with “gyaku zuki” Sensei showed them “tameshiwari”. And later in the restaurant he took a big knife and gave it to me. I attacked him and he showed karate techniques and his reaction. It was a real improvisation. — You know during “enbu”, training and seminars I always assist Sensei. Although I got used to his attacks I’m always astonished at how powerful his blows are. (Smiling.) When I see Yahara Sensei I can’t feel relaxed. — Have you got children? — No. My only child is my dog, cocker. (Laughing.) By the way, you can often see it in dog shows on TV. — In the Karatenomichi Cup in Tokyo we saw a baby in Yahara Sensei’s arms. Is it his son? — Oh, yes. The Japanese don’t believe Yahara Sensei has come down to earth and become and ordinary father! (Laughing.) His son’s going to be a year in February. — Have you got a dream connected with karate? — I don’t think so. But Ibuki (my assistant) wants to become a champion of the world. He’s young and he’s got plenty of time.